It’s true. 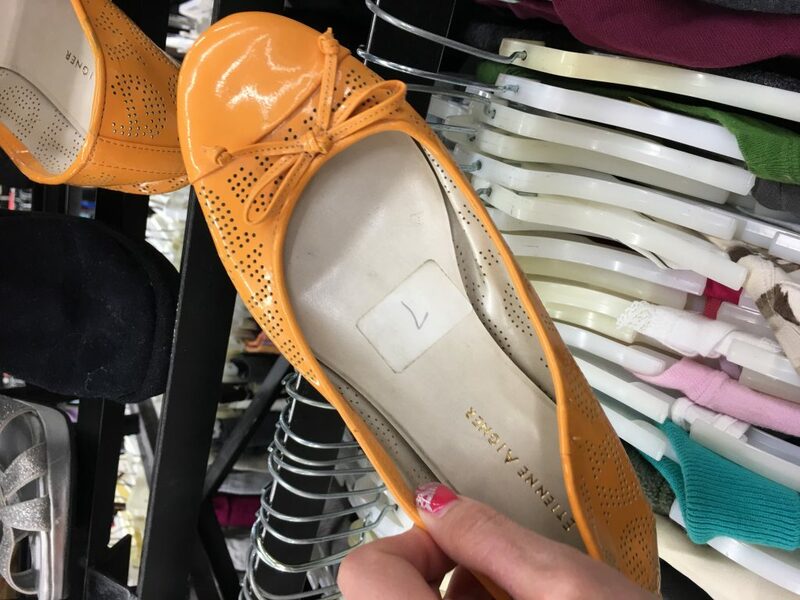 The price of the day is what you pay per item at Family Thrift Center. That along with the HUGE selection is the major pro of this thrift store. This isn’t even the whole store!!! 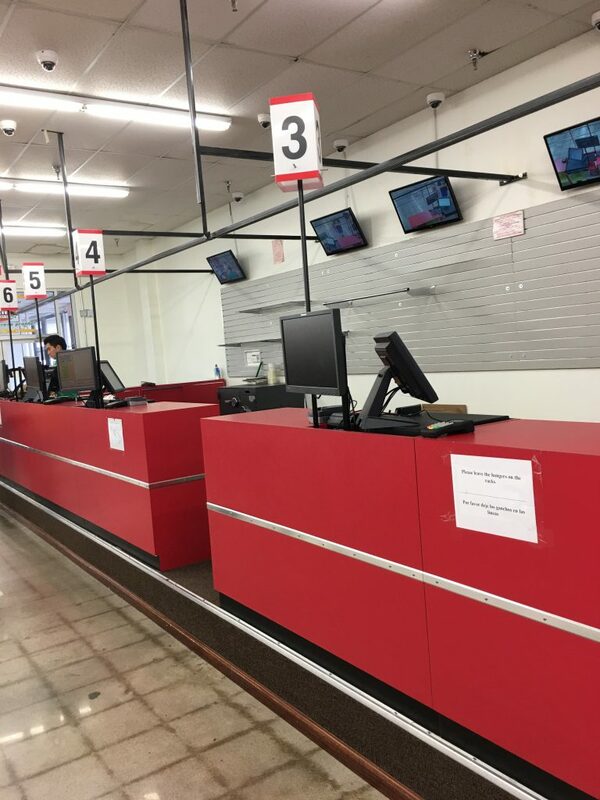 However, there were some significant cons starting with the complete lack of organization in the store. The pieces were loosely grouped according to men’s, women’s and children’s, but there was plenty of intermingling. 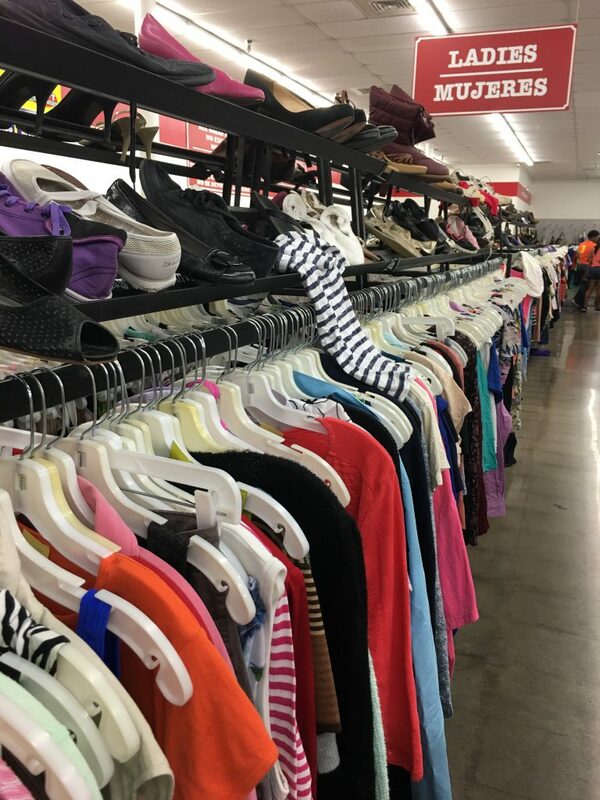 In other words, if you want to find treasures, you’ll have to scan ALL the racks. 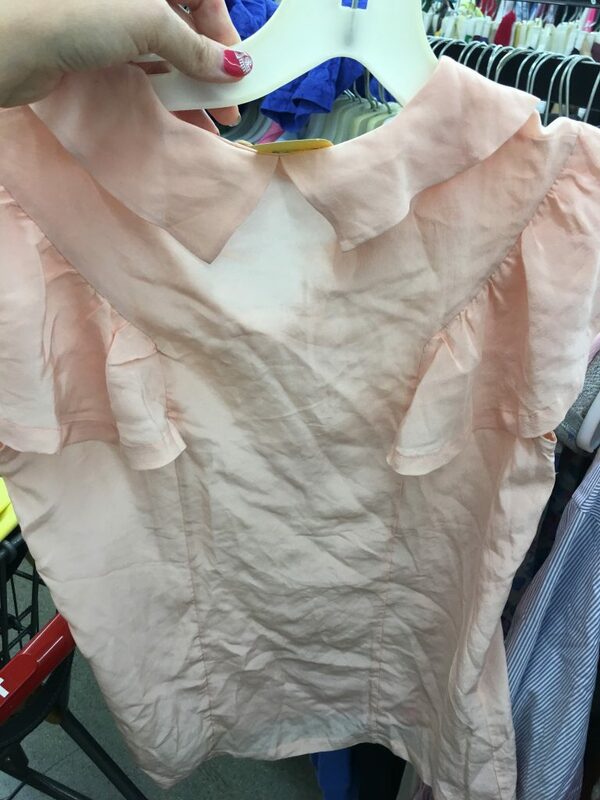 I went to what I thought was the dress section but in fact there were dresses scattered throughout the store, and no attempt at organizing by size. 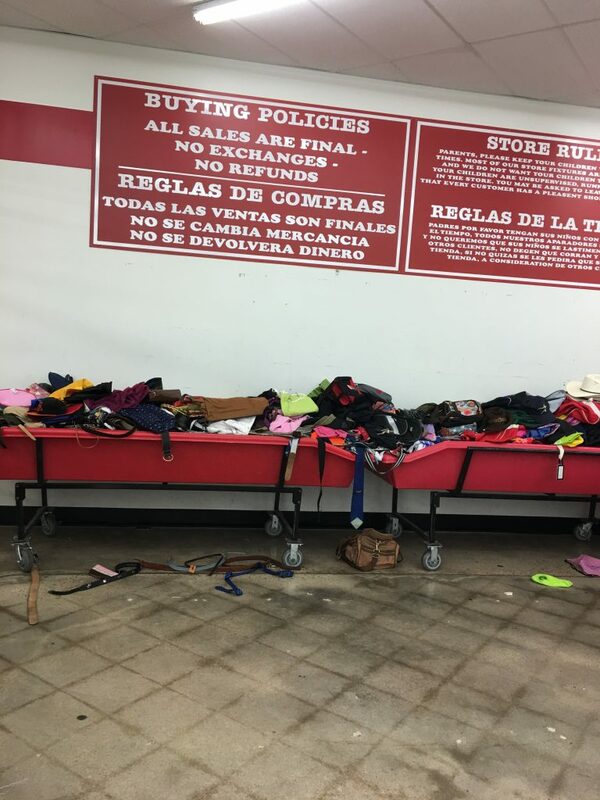 This isn’t necessarily a bad thing, I do enjoy rifling through the racks however there were no housewares, sporting goods or toys at this particular location so my kids were not occupied and made their own fun by playing walking hide-and-seek. Well walking most of the time. So you can imagine how relaxing that was for me. Here are a few shots I snapped in between hissing at my kids to stop running and giving them the STOP hand sign from across the aisles. I almost bought these and then remembered how I probably won’t wear pants ever again because Houston is hot a nice relaxing sauna. 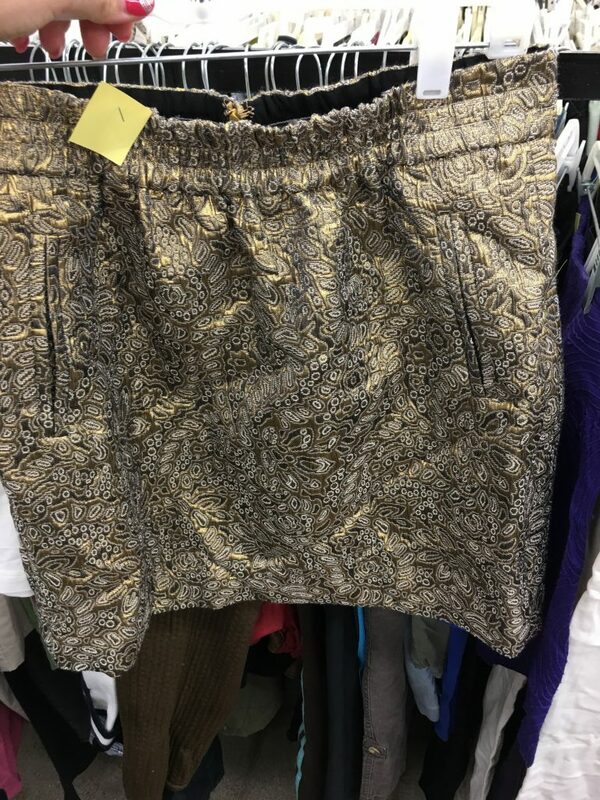 Skirt with pockets, think it was Loft. I would’ve got this if it were my size. 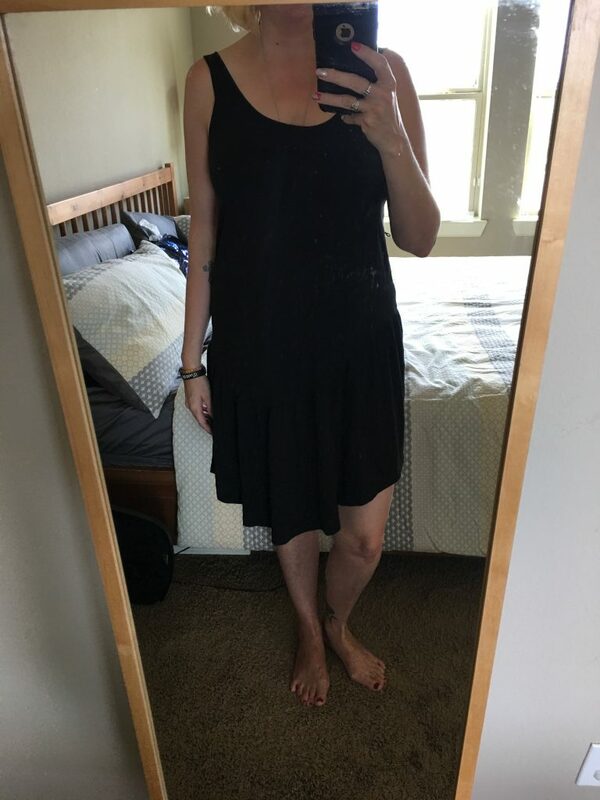 Olive & Oak maxi dress that I would have bought if it didn’t require a strapless bra which you just don’t wear in the sauna. A cute made in the USA dress/tunic for someone acclimatized to the weather. 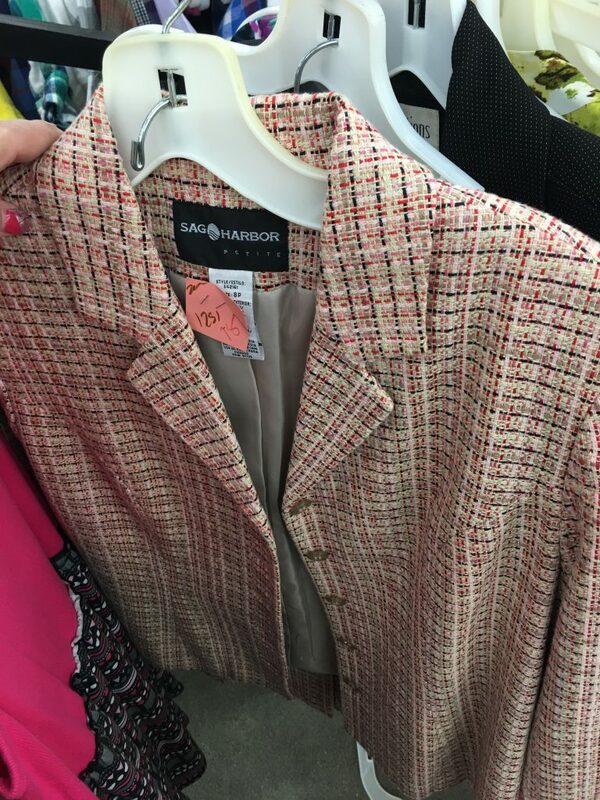 Suit – not sure if it counts as one or two pieces but either way, even if not a designer brand, $1.75 for a blazer in good condition is a sweet deal. 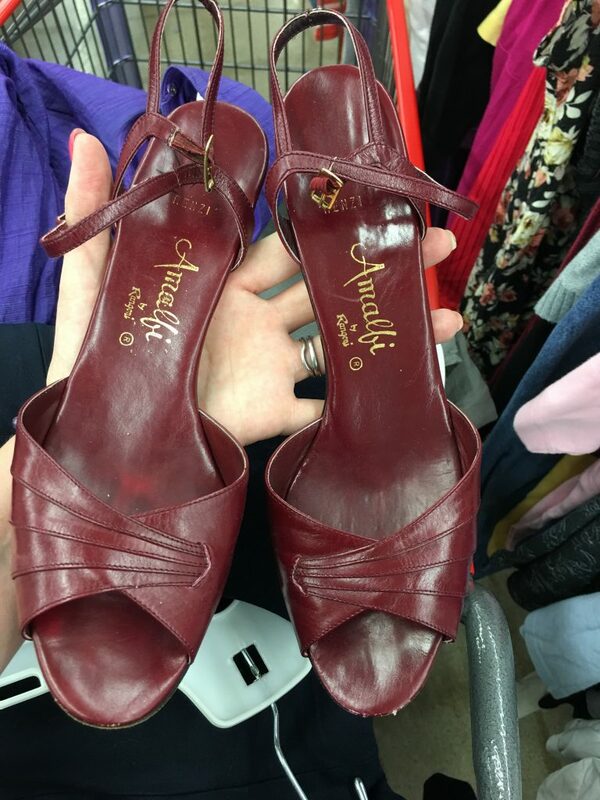 I liked the vintage vibe and colour of these Amalfi leather sandals. Also liked the colour of these Etienne Aigner flats and wished they were in my size. 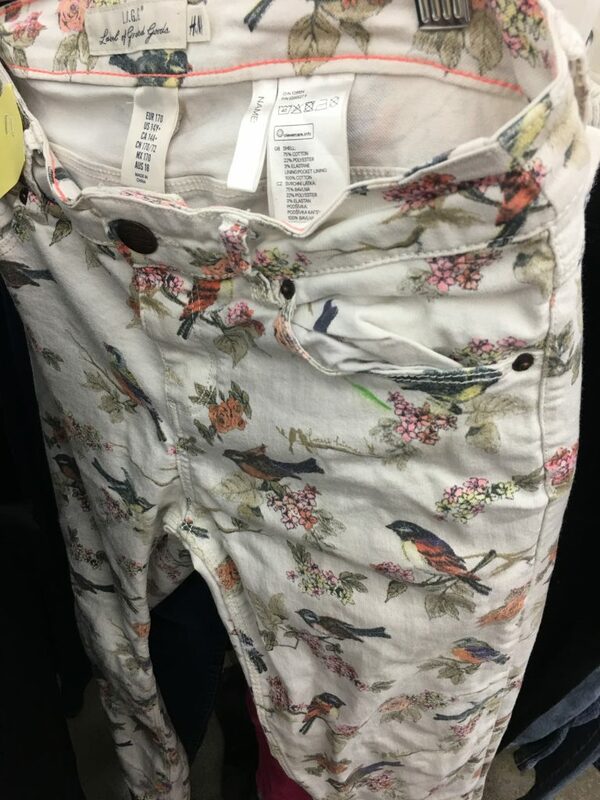 Love a good bird print and love getting fast fashion secondhand, but these were too small for me! I however did not attempt to go through the bins. 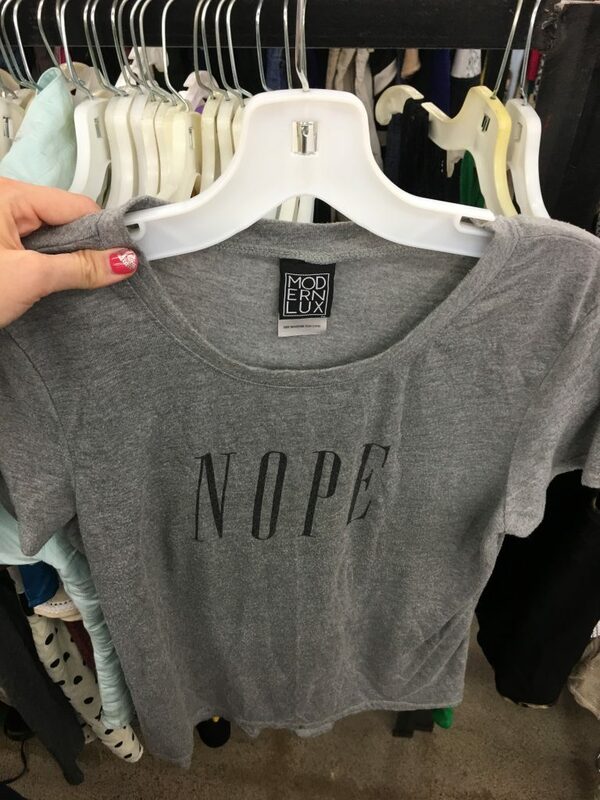 I have never done that kind of thrifting and I’m not sure I would enjoy it. This location had clothing, shoes and accessories – bags, belts and scarves. I don’t recall seeing jewelry. There were dressing rooms but they were all taped off, a little like a crime scene!!! 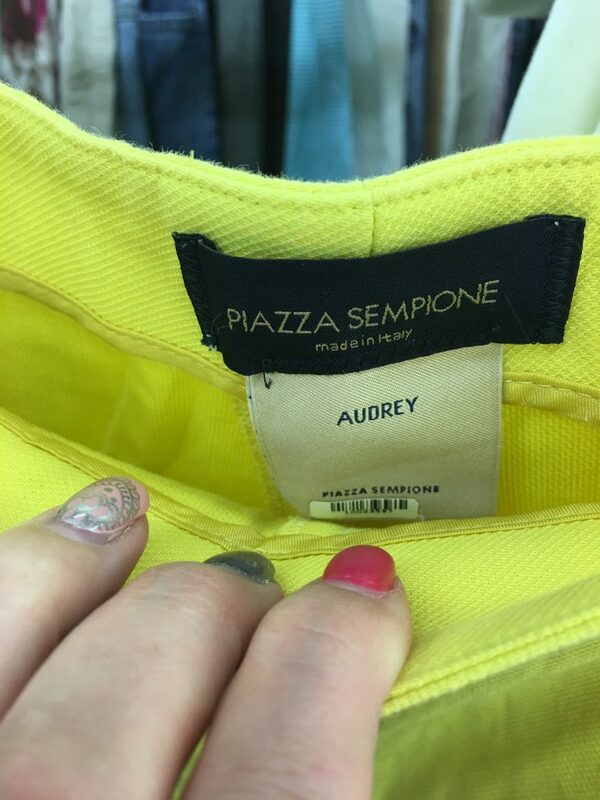 I did try on a couple of pieces in the aisles because even $1.75 isn’t a deal if it doesn’t fit. I did attempt to ask one clerk about the store but she outright ignored me. As in, looked through me and walked on by. 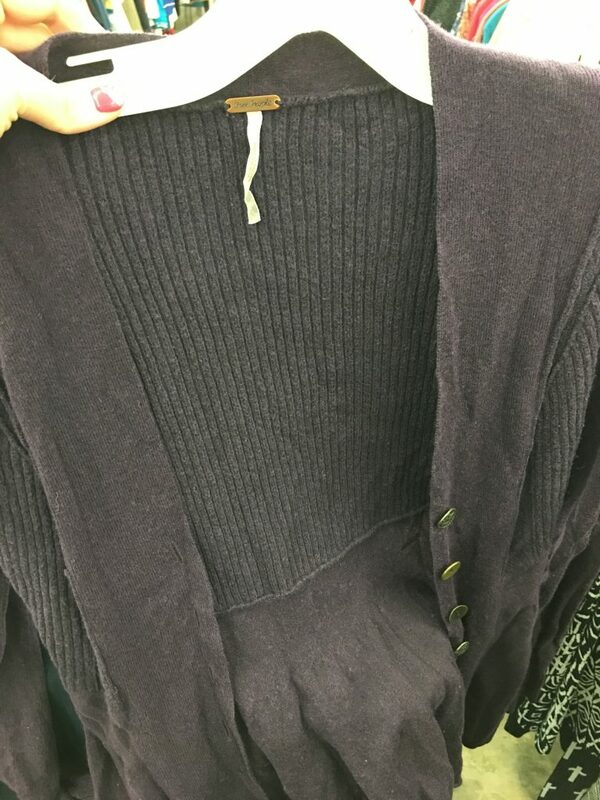 I wanted to shout, “I AM A NICE CANADIAN WHO LOVES THRIFTING AND THIS IS MY FIRST TIME HERE AND DON’T BE SO RUDE.” Instead, I politely asked the clerk beside her my question (is there a different price for pieces that have a tag on them), and stood there like a wall until she responded (no, everything is the price of the day, period). Was that so hard?! I’m guessing it gets pretty busy on Wednesdays when everything is 25 cents. 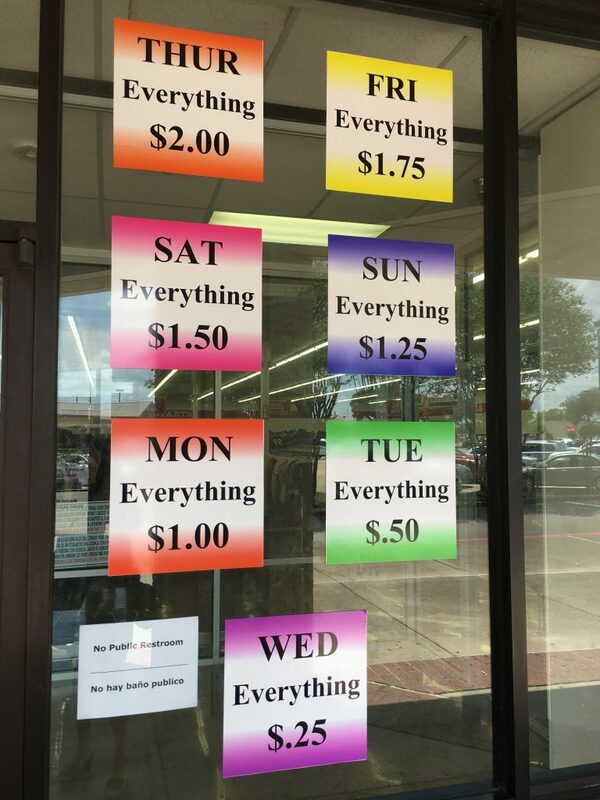 I was shopping on Friday so everything was $1.75. 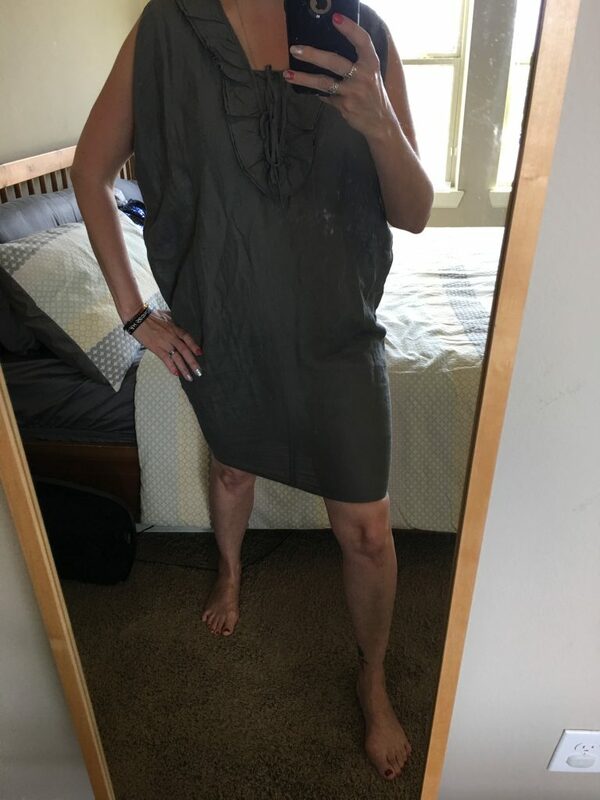 This Garnet Hill linen dress seemed light and airy, kinda sac-like. Don’t plan to stride anywhere wearing it though. 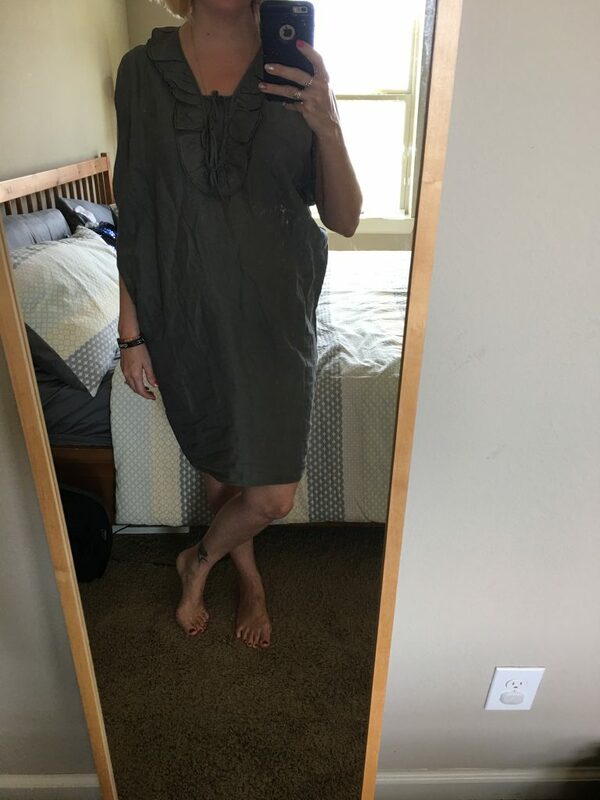 I don’t *love* it on but I’ll wear it a couple of times then donate it to Goodwill to sell for $9.45. 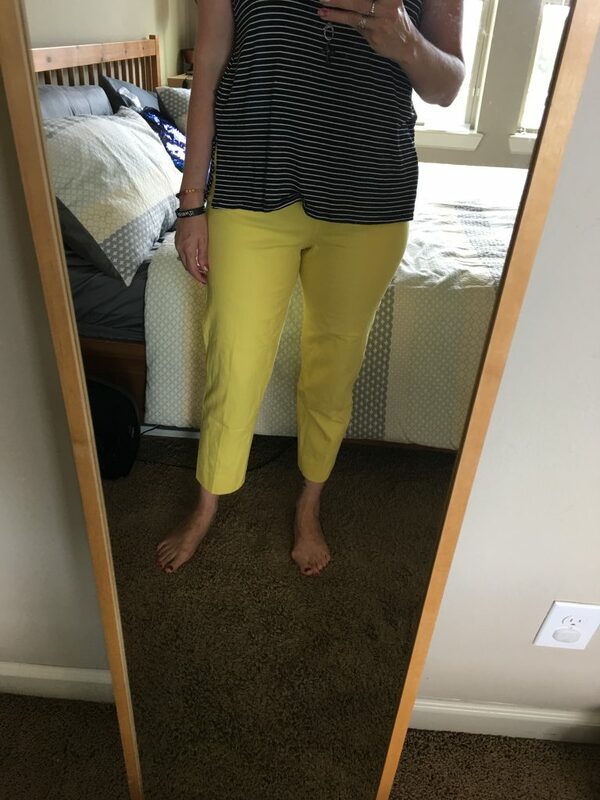 I know I know, I said no pants but these are yellow and I heart yellow. And these retail for $395 at Neiman Marcus so for $1.75 they were a major score! 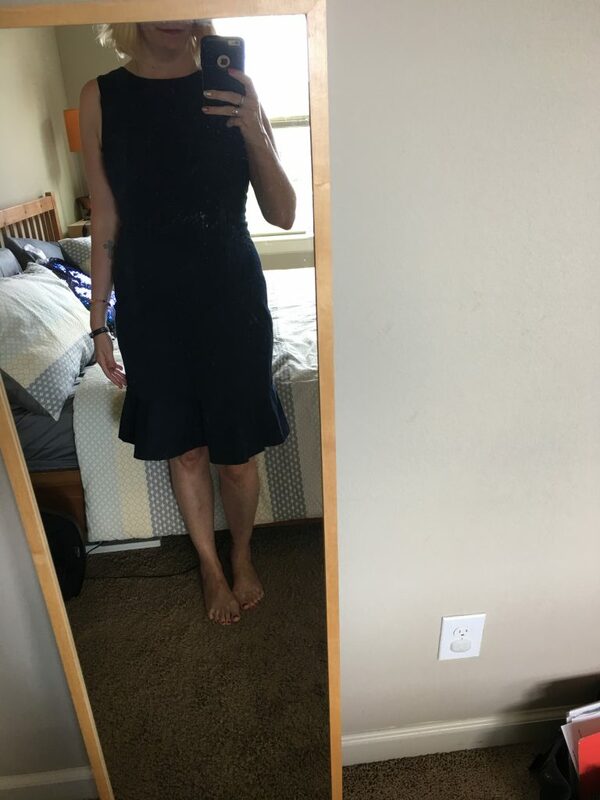 This J Crew navy dress is a classic style and fits like a glove. This dress retails for $168!! That means I paid about 1% of the regular retail cost and it’s in perfect condition. 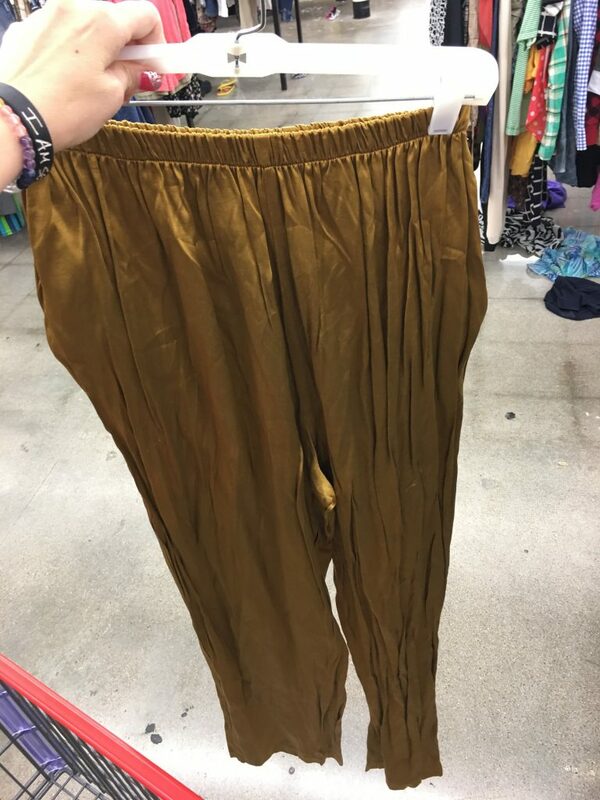 Sold on thrifting yet?!!! I’m actually going to spring for professional dry cleaning for this one. 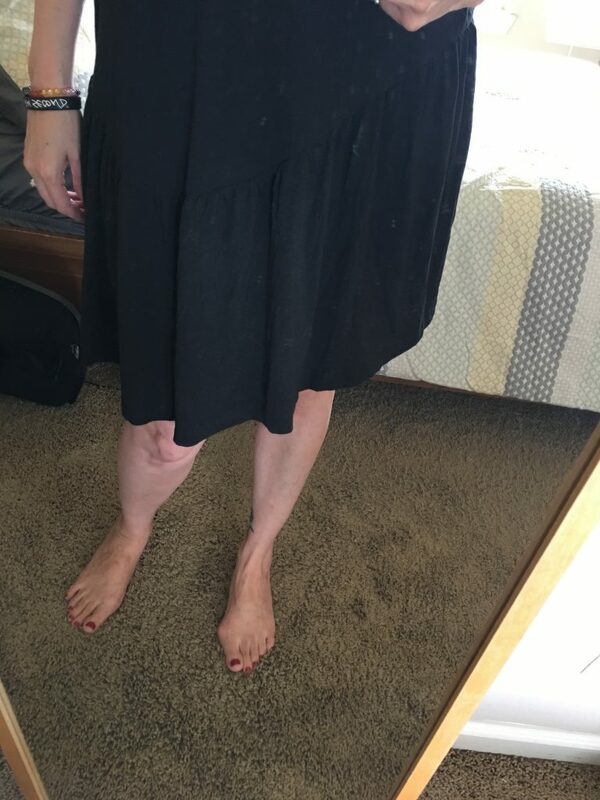 Last but not least, I scored this Theory dress! It’s meant to be belted but I’m going to wear it loose and casual! 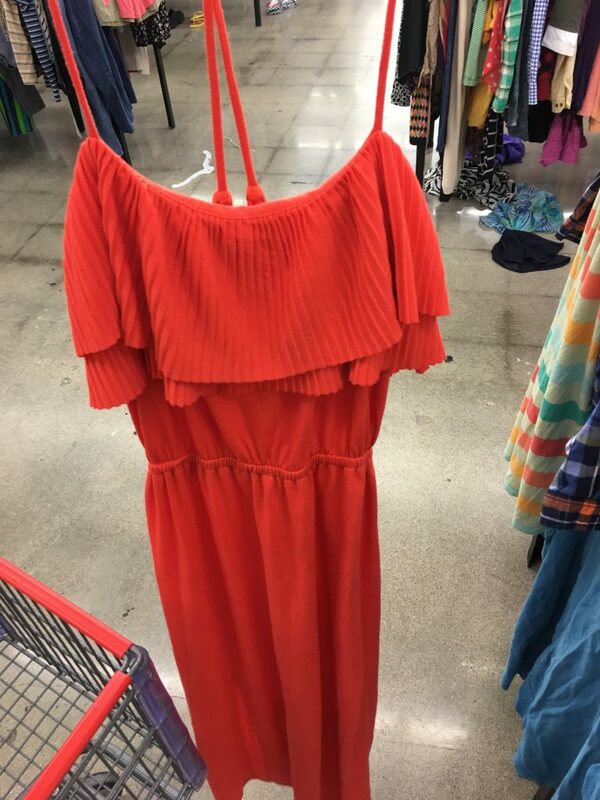 I liked the asymmetrical ruffle hem, believe it or not. 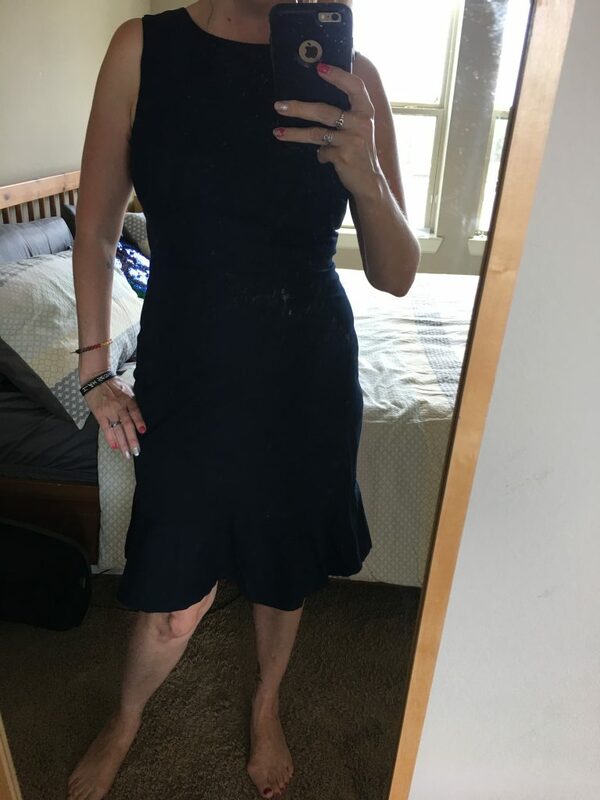 I couldn’t find this exact dress on-line but similar styles retail for $190 to $114 on sale. 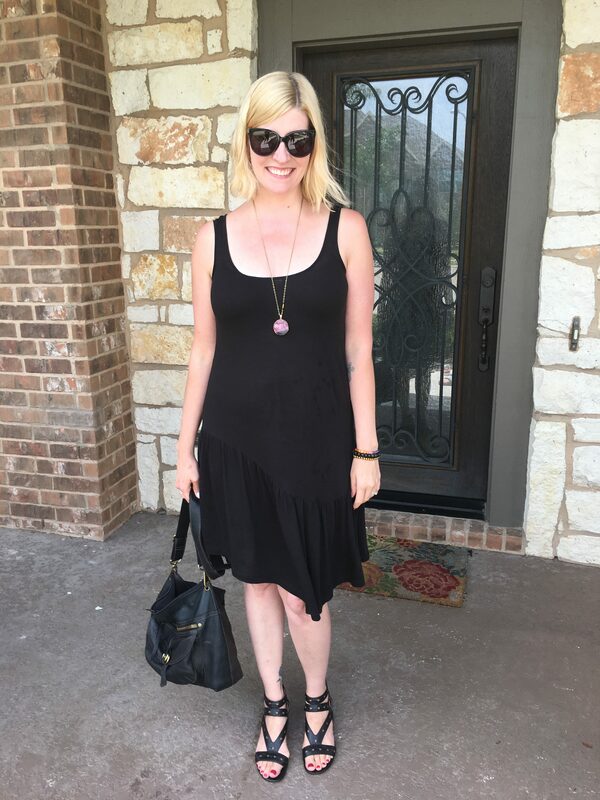 In fact, I wore the Theory dress on Sunday to meet up with some lovely Houston Instagrammers! Worn with my $13 Miz Mooz sandals, $21 leather Fossil bag and She Does Create pendant. 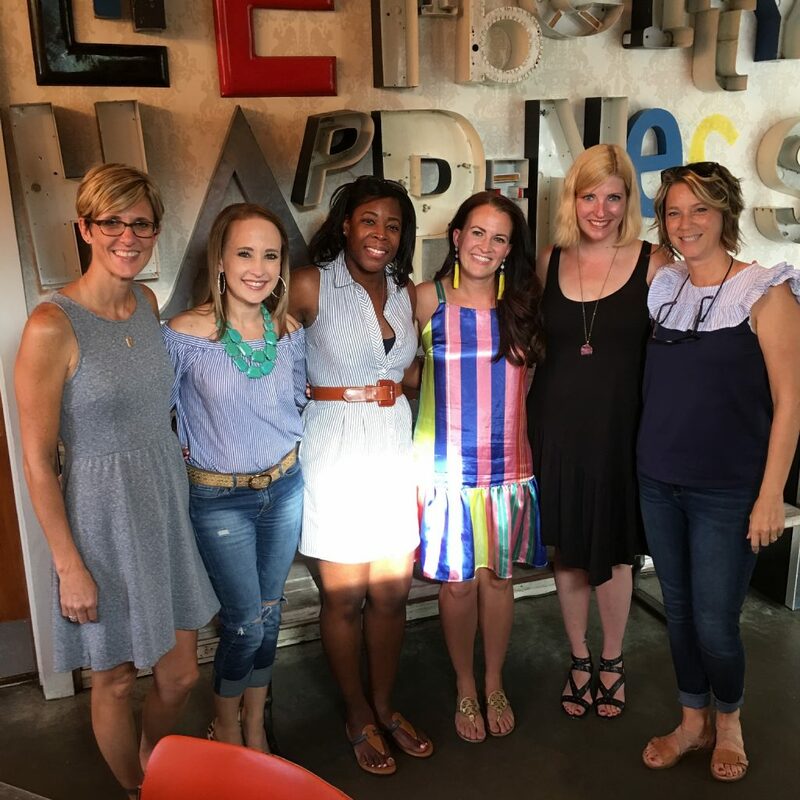 I had a great time meeting and getting to know these stylish women! It is so encouraging to see how social media works for good, helping people build relationships on-line and in real life! So wonderful to meet Pixie and Curls, All Things Style Erin, Frugal and Fabulous Houston, Pearls and Whimsy and Laurie POP! We had great mimosas and great conversation. Can’t wait for the next get-together! These ladies are fellow thrifters (!) so I hope to explore the local thrift scene with them soon! 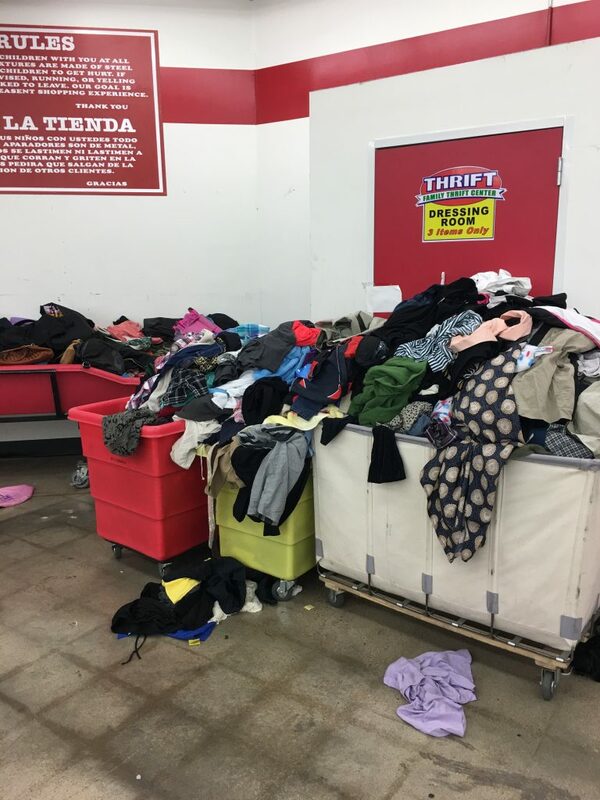 I will head back to Family Thrift Center without my children and better prepared to dig in and do some serious thrift hunting! And of course, I can’t wait for my sister and friends from Canada to visit and find some amazing thrift scores like I did! 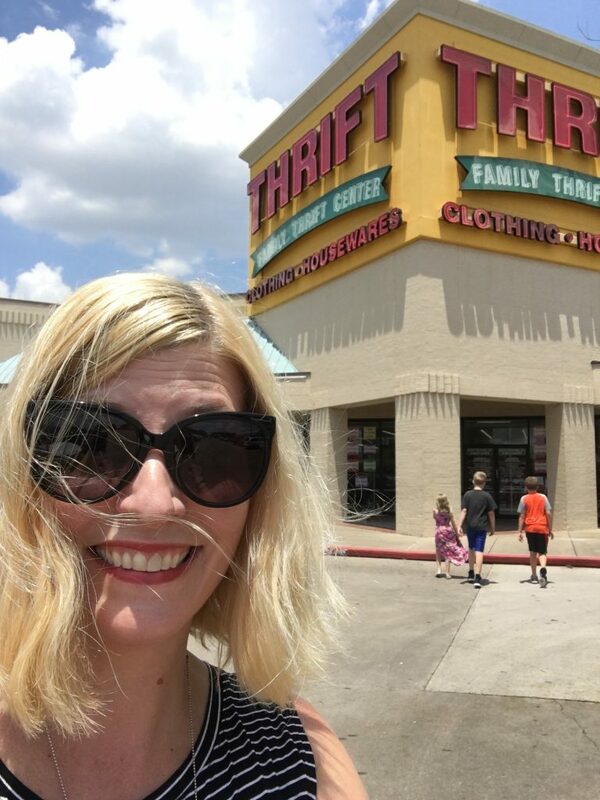 The thrift family outlet looks like a great place and you scored some great items – even with kids in tow which I know from experience can be nerve wracking. Love that J Crew dress. Looking forward to hearing about your future thrifting adventures. If you are ever in the Kansas City area, we have some well organized stores, great finds and polite staff. Thank you!!! 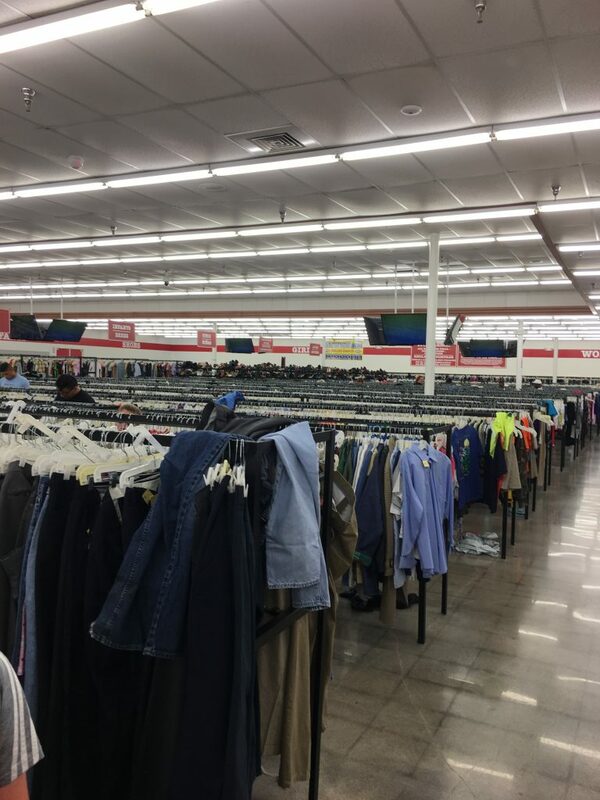 I would love to thrift all over the US! I’ll keep that in mind should I get to Kansas City!! hee hee I take full responsibility for inspiring thrifting!! How can anyone resist those deals?!! Welcome to Houston! You should try visiting their other westside location, which is on Highway 6 North just past Clay Road. The one you visited is one of their newer stores, and I found their disorganization incredibly frustrating. Their other locations are far more organized and offer a wider selection of goods, including handbags, drapes, art, movies, books, and housewares. 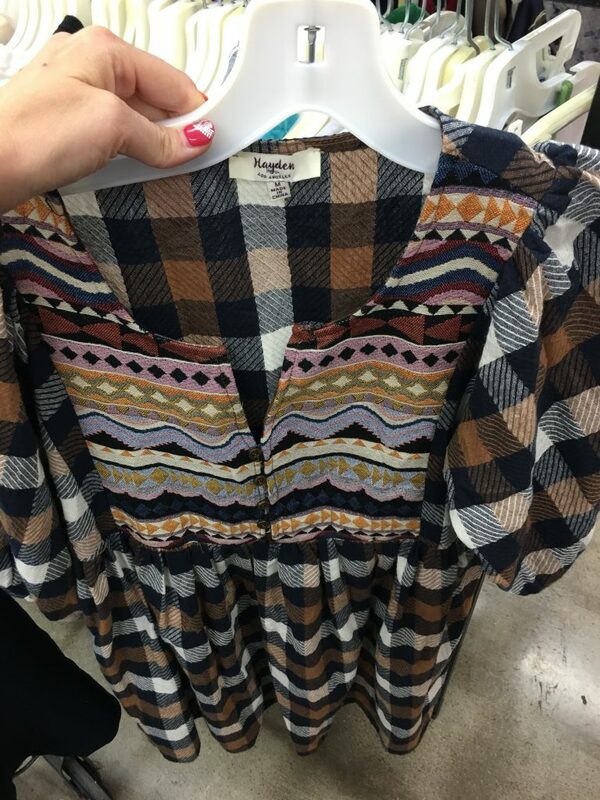 Happy thrifting!